In this file photo, Arnold Schwarzenegger waves as he arrives at the Elysee Palace prior to a meeting on climate change in Paris, Tuesday, Dec. 12, 2017. 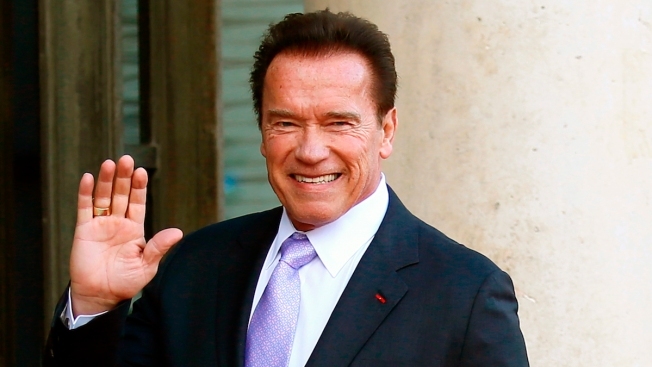 On Monday, Arnold Schwarzenegger tweeted an update on his condition after emergency open-heart surgery. "It’s true: I’m back! I went to sleep expecting to wake up with a small incision and woke up with a big one - but guess what? I woke up, and that’s something to be thankful for. Thank you to the doctors & nurses. And I’m truly filled with gratitude for all of the kind messages," the "Terminator" star wrote. The 70-year-old actor and former California governor had the operation after complications from a less-invasive procedure at a Los Angeles hospital. On Thursday, Schwarzenegger "underwent a planned procedure to replace a pulmonic valve that was originally replaced due to a congenital heart defect in 1997," his spokesman, Daniel Ketchell, said on Twitter. Ketchell said his condition was stable on Friday. "@Schwarzenegger is awake and his first words were actually 'I'm back,' so he is in good spirits," he said. He said Schwarzenegger's pulmonic valve was "successfully replaced" and thanked the medical team for their "tireless efforts." Schwarzenegger's family, including wife Maria Shriver, has not commented. The actor's 1997 surgery was elective and his spokesperson told the Los Angeles Times at the time that the procedure was carried out to repair a "congenital condition that's existed in his family." "I've never felt sick or had any symptoms at all, but I knew I'd have to take care of this condition sooner or later," Schwarzenegger himself said in a statement, according to the newspaper. "I said to the doctors, 'Let's do it now, while I'm young and healthy.' They agreed this was the way to go." The spokesperson also told the LA Times that "steroids have nothing to do with this." Schwarzenegger, a former Mr. Universe and Mr. Olympia, had acknowledged using steroids when he was a bodybuilder. Schwarzenegger did not tell his wife about his 1997 surgery and instead pretended he had merely gone on vacation.